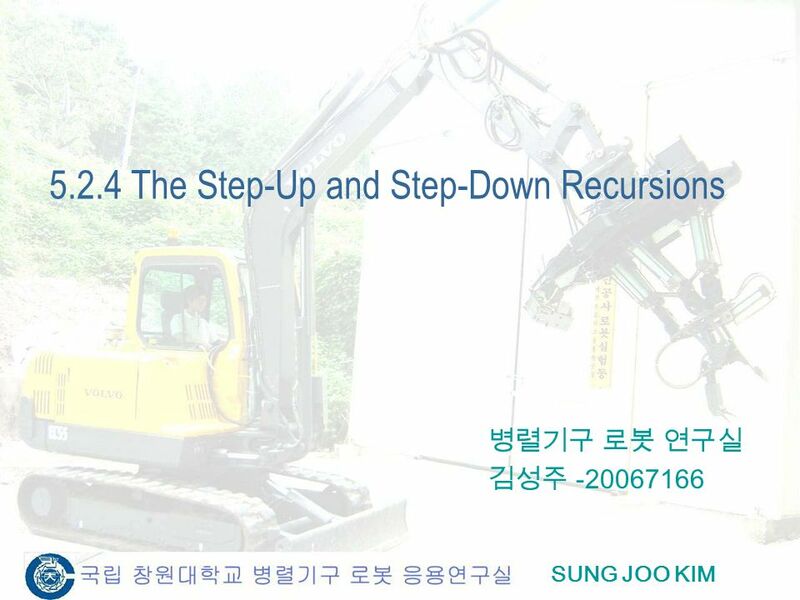 SUNG JOO KIM 5.2.4 The Step-Up and Step-Down Recursions -20067166. 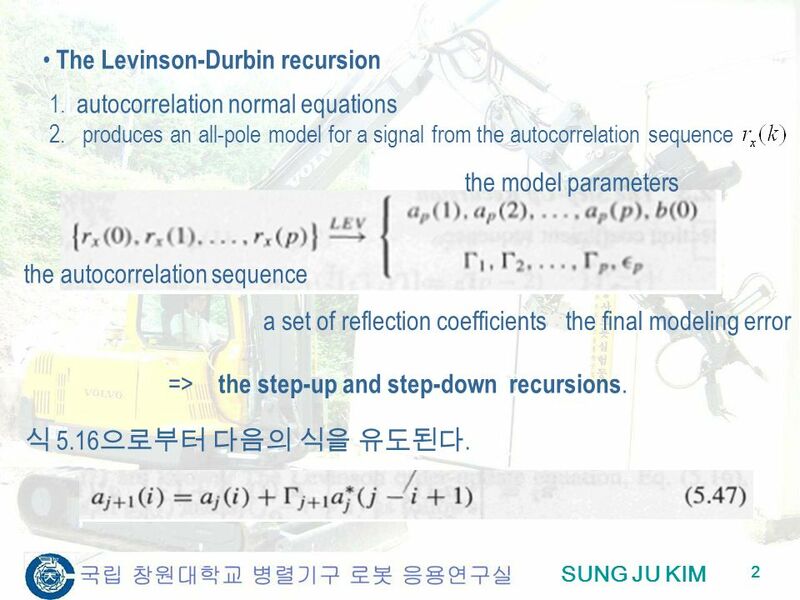 2 SUNG JU KIM 2 The Levinson-Durbin recursion 2. produces an all-pole model for a signal from the autocorrelation sequence 1. autocorrelation normal equations a set of reflection coefficientsthe final modeling error the model parameters the autocorrelation sequence => the step-up and step-down recursions. 5.16. 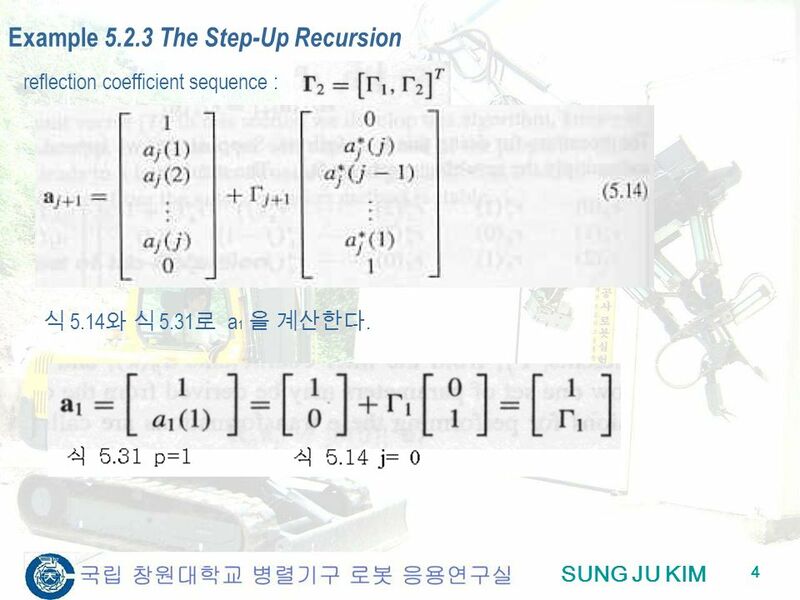 4 SUNG JU KIM 4 Example 5.2.3 The Step-Up Recursion reflection coefficient sequence : 5.14 5.31 a 1. 6 SUNG JU KIM 6 -. 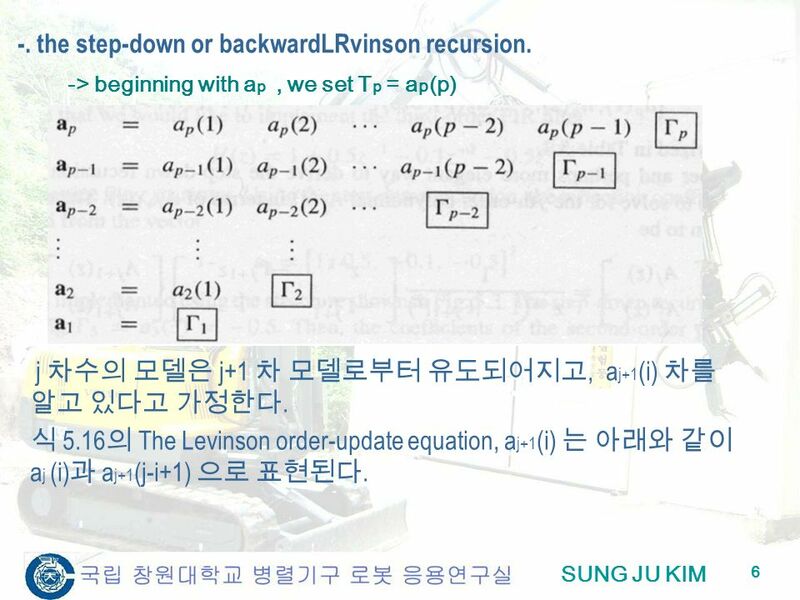 the step-down or backwardLRvinson recursion. -> beginning with a p, we set T p = a p (p) j j+1, a j+1 (i). 5.16 The Levinson order-update equation, a j+1 (i) a j (i) a j+1 (j-i+1). 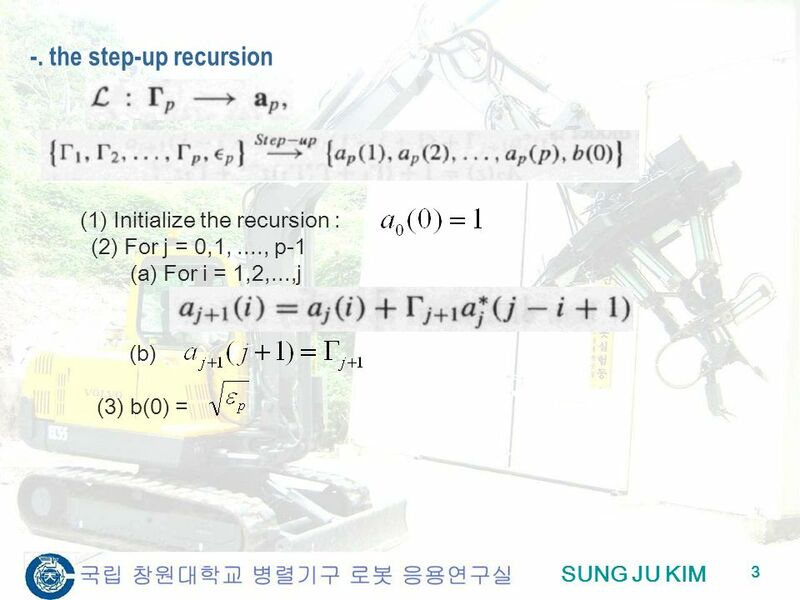 Download ppt "SUNG JOO KIM 5.2.4 The Step-Up and Step-Down Recursions -20067166." 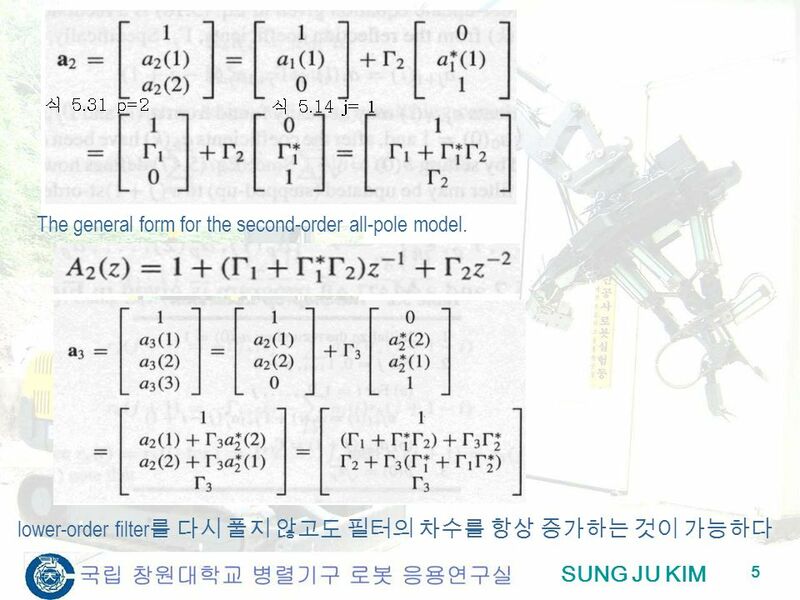 SUNG JU KIM 1 i = j - i + 1 complex conjugates matrix. Digtal Signal Processing And Modeling The Design of FIR Least Squares Inverse Filters Chapter Application / KIM. Correlation of Discrete-Time Signals Transmitted Signal, x(n) Reflected Signal, y(n) = x(n-D) + w(n) 0T. E E 2415 Lecture 16 2 nd Order High Pass, Low Pass and Band Reject Filters. ECE 8443 – Pattern Recognition ECE 8423 – Adaptive Signal Processing Objectives: The Linear Prediction Model The Autocorrelation Method Levinson and Durbin. AGC DSP AGC DSP Professor A G Constantinides©1 Modern Spectral Estimation Modern Spectral Estimation is based on a priori assumptions on the manner, the. A Practical Guide to Troubleshooting LMS Filter Adaptation Prepared by Charles H. Sobey, Chief Scientist ChannelScience.com June 30, 2000. AGC DSP AGC DSP Professor A G Constantinides©1 A Prediction Problem Problem: Given a sample set of a stationary processes to predict the value of the process. ECE 8443 – Pattern Recognition ECE 8423 – Adaptive Signal Processing Objectives: Newton’s Method Application to LMS Recursive Least Squares Exponentially-Weighted. Pole Zero Speech Models Speech is nonstationary. It can approximately be considered stationary over short intervals (20-40 ms). Over thisinterval the source.